The sea-surface bioproductivity changes over the last 25 kyr were inferred from published data on 30 sediment cores from the open Northwest Pacific (NWP), Sea of Okhotsk, Bering Sea and Sea of Japan accounting for the glacioeustatic sea-level changes. A novel method was developed to compare the variations of several independent productivity proxies relative to the present-day values. During the Last Glacial Maximum, the bioproductivity in the Sea of Okhotsk and the western Bering Sea (BS) was lower than at present, whereas the southern and southeastern Bering Sea and the open NWP are characterized by enhanced bioproductivity. During the early deglacial stage, an increase in bioproductivity was estimated only for the southeastern Bering Sea. High and fairly high bioproductivity was estimated for Heinrich 1 in the open NWP, above the Umnak Plateau and on the Shirshov and Bowers Ridges in the Bering Sea. The high productivity in the Bering Sea, Sea of Okhotsk and NWP during the Bølling/Allerød was caused by the global warming and enhanced nutrient supply by meltwater from the continent. During the Early Holocene, high productivity was estimated for almost the entire NWP. The Late Holocene sea-surface bioproductivity was generally lower than that of the Early Holocene. Proposed factors that have controlled the sea-surface bioproductivity during the last 25 kyr include: the location of the sea ice margin, the river runoff, gradual flooding of the Bering Sea and the Sea of Okhotsk shelf areas, the water mass exchange between the marginal seas and the open NWP, the eolian supply and the deep vertical mixing of the water column. Original Russian Text © E.A. Ovsepyan, E.V. Ivanova, L.O. Murdmaa, G.N. 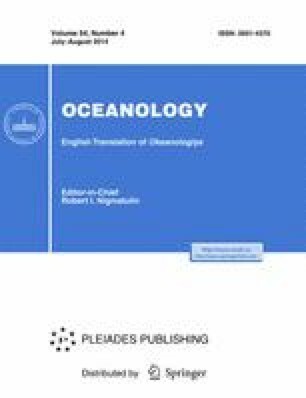 Alekhina, 2014, published in Okeanologiya, 2014, Vol. 54, No. 4, pp. 546–560. The GEBCO One Minute Grid, ver. 2.0, http://www.gebco.net.